The Eldon Hygienic Design HDW range is designed and constructed with special materials for high sanitary operations and ease of thorough cleaning. The gapless design, the self-drainable high-polished surfaces, together with a high protection degree help reduce non operative hours, such as cleaning and maintenance, which leads to increased productivity. Body: 1.5 mm. Door: 2 mm. AISI 304 pre-grained stainless steel. Mounting plate: 2 mm galvanized steel. Monoblock body, folded and seam welded. The top of the body is equipped with a sloping roof at an angle of 30 degrees towards the front, ending with a 30 mm overhang to avoid any draining liquids from dripping onto the gasket and the door. Corner formed in one piece with a sloping angle of 8° on all sides. Surface mounted with 120° opening. Concealed hinges with captive pin. Can be mounted to give left or right hand opening (machining is not required). The door hinge has been especially designed to fit concealed inside the enclosure once the door is closed, avoiding dirt deposits that would accumulate if it were outside, thus making the enclosure easy to clean. Sealing is ensured by an all-round one piece removable blue silicone gasket. The silicone is FDA 21 CFR 177.2600 compliant. HD lock made of stainless steel AISI 316L with blue silicone gasket, the lock conforms with norm DIN EN 1672-2:2009. Fixed onto M8 studs welded on the rear of the enclosure. All sides from 800 mm and above are strengthened by folded edges. The mounting plate is marked vertically at 10 mm intervals for easy horizontal positioning of equipment. No gland openings as standard to avoid hygiene risks. Corresponds with IP 66/69/69K | TYPE 4X, 12, 13 | IK08. 400 Pre-grained stainless steel, polished to Ra < 0.8 µm. For accessories on the outside of the enclosure please see our HD accessories section. Hygienic Design stainless steel single door wall mounted enclosures, with smooth self-draining surfaces, integrated sloping roof, silicone gasket, concealed door hinges, Hygienic Design locks and IP 66/69/69K protection degree. The smooth self-draining sloping surfaces avoid accumulation or pooling of food product, water or chemicals. The gap-free design offers no spaces for contaminants. The high ingress protection degree allows easy and thorough cleaining with high pressure and temperature water jet, while the installed components inside the enclosure will be safe and secure. The enclosure complies with strict hygiene standards, which reduces cross-contamination risks in industries such as food and beverage or pharmaceuticals. The high protection degree and self-draining surfaces reduce labour cost for maintenance and cleaning. Furthermore component failure and unnecessary downtime is avoided as water and dust are prevented from entering the enclosure. 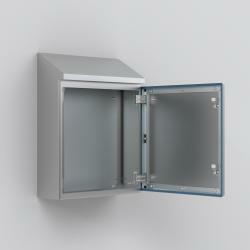 Stainless steel enclosures can be installed in almost any environment.